Tricide-Neo is a safe, effective easy-to-use antibacterial dip treatment that heals ulcers, mouth rot and fin rot in koi and goldfish. Plus it also treats bumblefoot infection in birds, especially chickens, roosters etc. I have used Tricide-Neo several times over the years and have found it to be very effective at treating bacterial infections in koi, especially in serious cases where topical treatments won’t likely work well enough. . Using Tricide-Neo is as simple as bathing the koi or goldfish in the solution for 4 to 5 minutes a day, for 7 days. 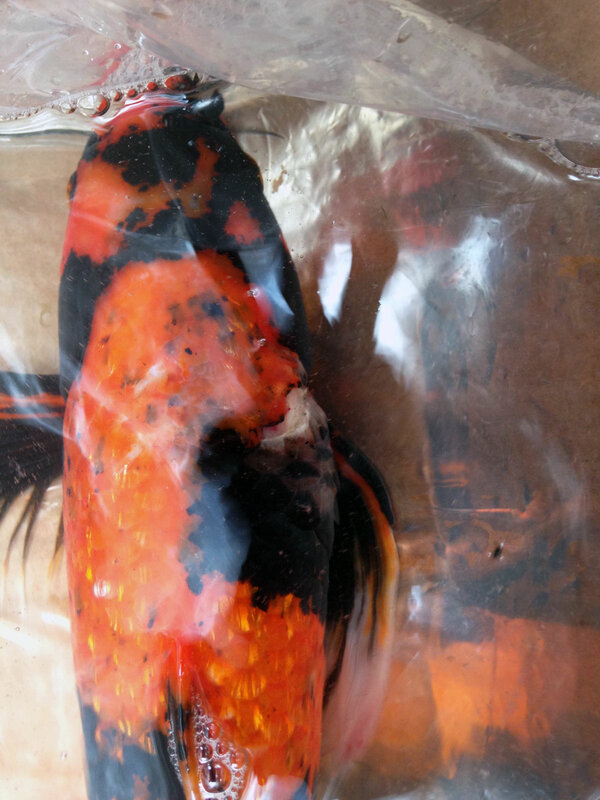 Look below for more information about how well Tricide-Neo worked for us on one of our koi. Tricide-Neo is an antibacterial fish dip treatment that is easier to use and just as effective as antibiotic injections. It works very well on topical infections like ulcers, fin rot and mouth rot. Tricide-Neo contains the antibiotic Neomycin, combined with a powerful potentiator that basically punches holes in the bacteria’s cell wall and allows the neomycin into the cell where it goes to work. Until recently, the most effective treatment has been the administration of antibiotics by means of injection, which is is difficult for the average hobbyist, as these drugs and supplies require a prescription from a licensed Veterinarian. The advantages of Tricide-Neo are that it is safe to use, easy to use and its effectiveness against both gram-positive and gram-negative bacteria. Tricide-Neo is available in 1-gallon and 5-gallon mixes. The 1 gallon mix will treat smaller fish – up to about 10″ / 25 cm long. If you have larger fish, or many fish to treat, the 5-gallon mix is a better choice. Open the packet and mix the crystals into the appropriate amount (1 gallon or 5 gallons) of distilled water. Ensure that this mixture is the same temperature as the pond water. I often aerate the mixture with an air pump and airstone to help oxygenate the water and to help dissolve the crystals. Once the crystals are dissolved, dip the fish in the Tricide-Neo for four to five minutes. If the fish shows signs of distress, remove it and return it to the pond or holding tank. After the 4-5 minute dip, return the fish to the pond or hospital tank. I often rinse the fish in a separate container of pond water before returning them to the holding tank to prevent intruducing Tricide-Neo into the holding tank. Repeat treatment every day for for 1 week. The solution can be reused repeatedly. I recommend filtering the solution through cheesecloth, coffee filter etc. to remove any loos scales or excess slime from the fish. Refrigerate the solution after each use. Remeber to allow it to warm up before the next use. This is a powerful medication! The fish should NOT be dipped for more than five minutes, or gill damage can occur. If you are treating many fish, you might need to mix a new solution after the fourth treatment. The last time I used Tricide-Neo was a few years ago. One morning, as I walked over to our display pond, I was greeted by a rather large heron standing at the edge of the pond, right at the spot where I feed the fish. As soon as it saw me, it took off and fortunately didn’t return. I wasn’t sure if the heron managed to take any of the smaller fish, but I did notice a few very small scrapes and scales missing from some of our larger koi. It wasn’t until a few days later that I noticed one of our Hi Utsuri butterfly koi sitting on the bottom of the pond, the right side of it body was very swollen. Luckily, I managed to catch this koi quite easily and transfer fer it to a quarantine tank. On the side of the body, just below the lateral line I noticed a large, open wound where the heron had stabbed the koi. The initial wound had become infected, it was now very red and raw and about the size of a quarter. At this point, the koi was in very weak and in poor condition, few more days left untreated and I think this koi would not have made it. I treated the koi following the directions above, dipping it once per day for 6 treatments. After the sixth treatment, the wound looked very good, clean, white and new tissue was already starting to grow back so I decided not to do the final dip. I also used Melafix in the quarantine tank treating daily as directed. I find Melafix really helps to heal wounds and it won’t negatively affect the biological filter. The day after the first treatment, the koi looked much better. The swelling had gone down significantly, the redness was almost gone and the wound itself looked much cleaner. Approximately 3 weeks after the final treatment of Tricide-Neo, this butterfly looked as good as new. 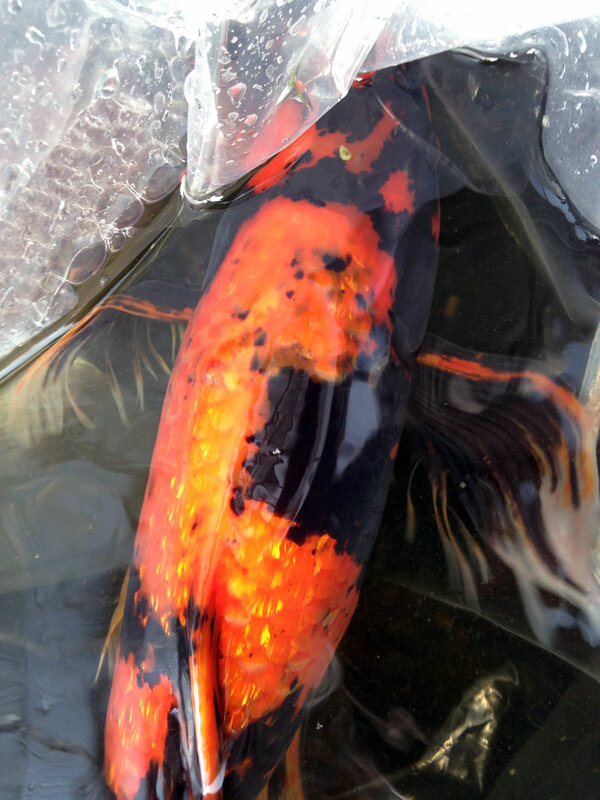 The wound had healed completely and the koi was ready to be returned to the pond. If you want to purchase Tricide-Neo, just click one of the sizes below.